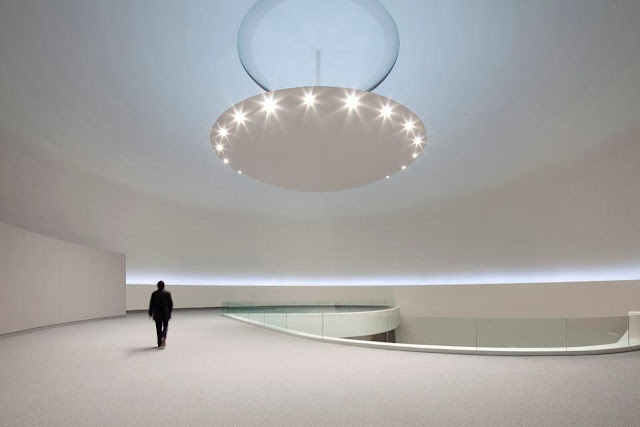 The Centro Niemeyer in the Spanish industrial town Avilés closed its doors last month, although it had only been open for a half a year. Due to severe budget cuts and political issues related to the Spanish economical crisis, there was just no money left to keep it open. 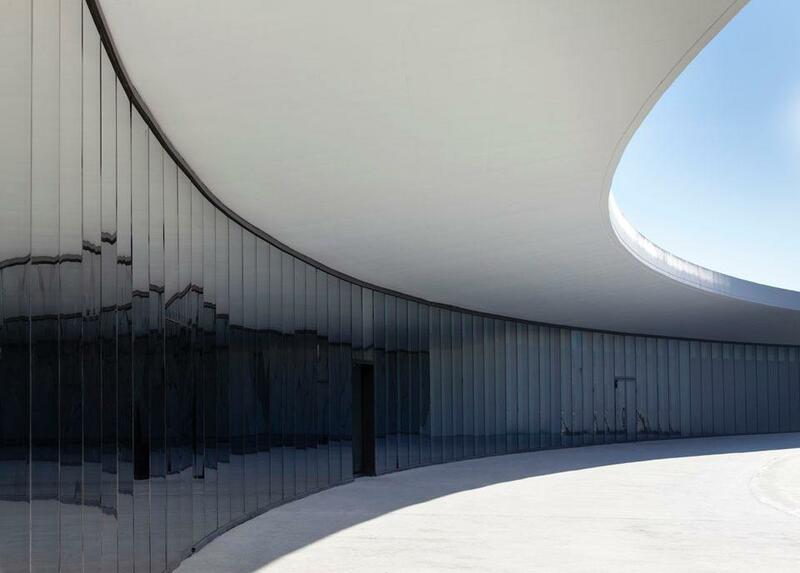 The Centro Niemeyer was designed by Brazilian modernist architect Oscar Niemeyer and had a total price cost of $44 million Euros. Euro watch dogs will probably see this as another example of excessive spending but in the long run, this will probably be a good thing for Spain since Oscar Niemeyer is not getting any younger and this may very well be his first and last work in Europe (he is 103 years and counting). Modern architecture has long been compared to science fiction: not just in its formal and material ambitions, but socio-spatially, where the ideals of total democracy and gridded master planning converge. Exuberant, utopian futurism arrived at through human innovation. Yet now we usually experience modernism through the tint of wear and nostalgia; the optimism of atomic-era design seems misplaced in the globalized climate. Nevertheless, the future pushes on. 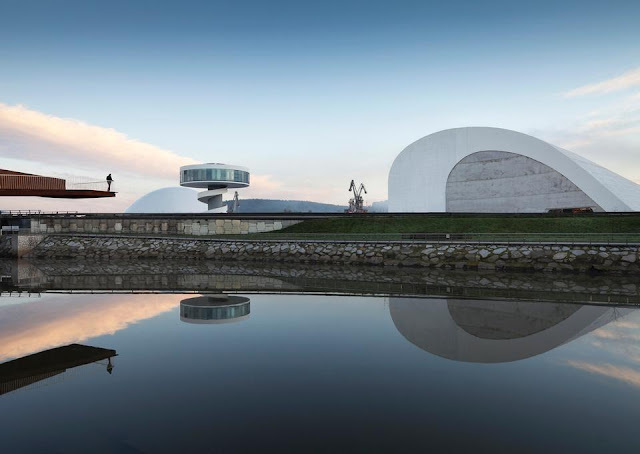 Currently set for landing in the base of the medieval town of Avilés, located in Spain's northern Asturias region, Centro Niemeyer is a surreal, space-age barge; a fantastic monument to the shifting cultural economies of the twenty-first century. Surreal, perhaps simply for its freshness, but also for its hugeness and finesse; its stark contrast to the labyrinthine, stony streets of surrounding town. Space-aged, in the sense of the antique future we see in visionary pop culture from The Jetsons to 2001: A Space Odyssey. The new Centro embodies both the classic neutrality of the twentieth-century International Style and contemporary strains of cosmopolitanism and sustainability. Surprisingly, the Brazilian architect's first project in Spain had to wait for his centennial. 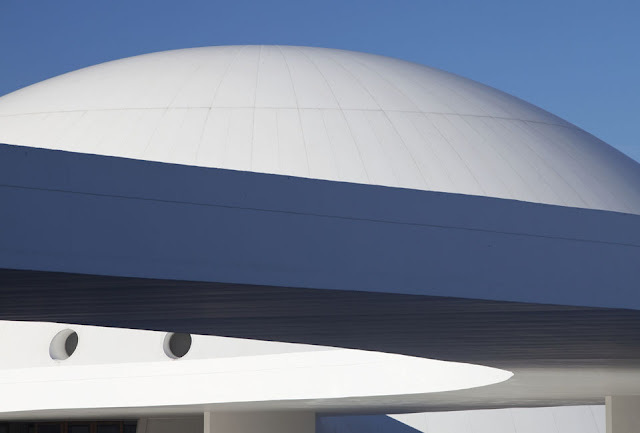 At 103 years of age Oscar Niemeyer is again fleshing out his signature take on heroic Modernism with a set of buildings formally reminiscent of some of his greatest hits, such as the São Paulo Palace of the Arts and of course Brasilia. Central to the complex is a three-storey, 50-foot concrete dome anchoring a monumental public square. Comprising a Museum, Amphitheatre, Restaurant and Reception buildings, the Centro is a minimalist field of formal abstraction with the spatial logics of natural attractions, great canyons and soaring cliffs. At the completion stage, clear of even way-finding signage and other advertisement, a visit rekindles longing for walks on the moon. Imagine if the great land artists had a greater penchant for reinforced concrete and you're there. 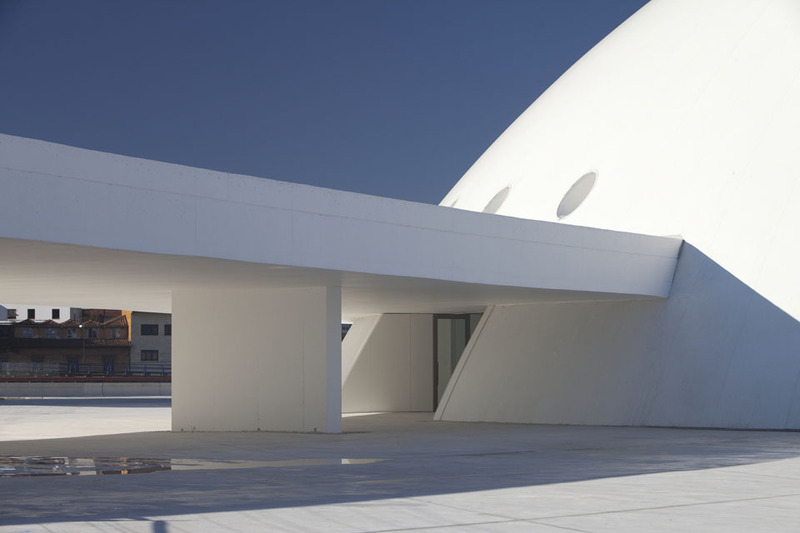 The Museum's exterior was created in just one day by pumping concrete onto a PVC inflatable mould. Inside, pristine expanses appear to hover inches above the ground. A four ton chandelier casts multiplying shadows in gill-like depthless bands. Certainly until programming begins the space will remain overwhelmingly simple. 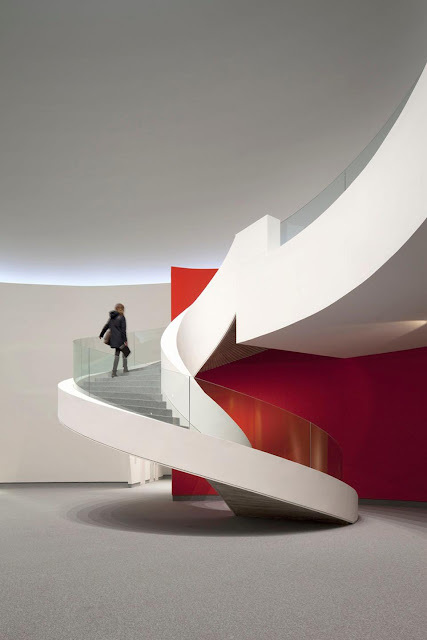 A mezzanine accessed via a striking red, spiraling stairwell suggests that light and sound installations may be set off here quite explosively. The Amphitheatre, noted for embodying the most complex, irregular curve among the new structures, will seat 1000 and opens onto the public square. Given demand and occasion, audiences will get a pretty clear view of the stage from both inside and outside. A wide slope, slowly turning up from the ground at the entrance comes back toward the earth at nearly (but not quite) a right angle. A great yellow swash amplifies Niemeyer's touch for a vibrant, sensual (rather than purely rationalist, functional) modernism. Acoustics also promise excellence. What's more, Foster + Partners are at work on an extensive urban plan to transform the surrounding area. What is currently a very dirty industrial steel manufacturing port will become the Island of Innovation, projected to be a hub of outdoor recreation, solar and wind energy research by 2020. Any lingering smog from the neighboring coal-fired factories will yield to a landscape punctuated by minimalist public architecture elements. The master plan includes clearing the estuary to carve the site away from the mainland, making the site accessible by boat. From the sky, the new island and its surrounding marina describe the symbolic outline of a fish. Programming also promises to be exceptional, because behind the board at Centro Niemeyer is the so-called C8 ("c" being, of course, for cultura). Responsible for the development of exhibitions destined for the world stage, inclusive of performances, screenings and other Centro creations are representatives from international venues including New York's Lincoln Center, London's Barbican, the Sydney Opera, La Scala in Milan, Tokyo Forum and the Library of Alexandria, Beaubourg, Paris, and Cultural Center, Hong Kong. Largely inspired by Bilbao's economic resurrection, the Centro emphasizes this focus on content to generate global sensation. With a creative board including global celebrities, scientists and intellectuals such as Woody Allen, Kevin Spacey, Paulo Coelho, Stephen Hawking, Fatima Mernissi, Vinton Cerf, Joan Manuel Serrat and Wole Soyinka, the "Avilés effect" may already have taken hold. With a 40,000,000 euro price tag, costs of the construction project thus far have been paid for exclusively by Avilés and the Spanish government. Anticipating return on investment within the first year alone through global tourism, the Centro plans to shift its support base towards the private sector. While long-term local interest may be questionable, a weekend open house in August last year welcomed over 12,000 visitors. Is this all apropos for a complex designed by an unapologetic Marxist, whose social-humanist ethos and stated feelings about the insignificance of his own trade led him always to do things his own way? 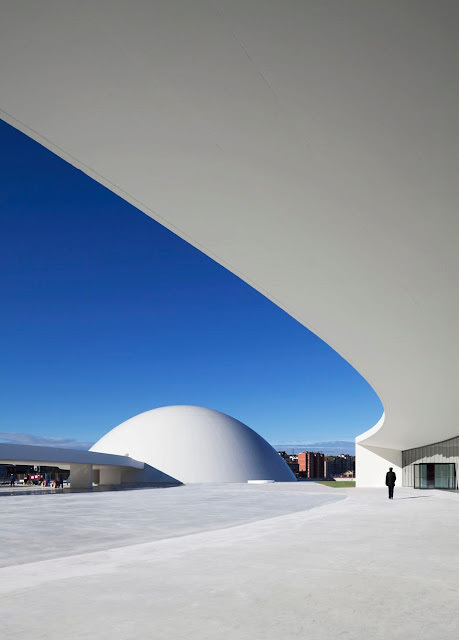 Niemeyer intends to mean above all sticking by life: enjoying good times, friends, family and the resonance of nature. An immensely generous and apparently untiring spirit, the architect was from the start obsessed with a particular, rather than international Modernism, devoted to making spaces to embrace history and nature. 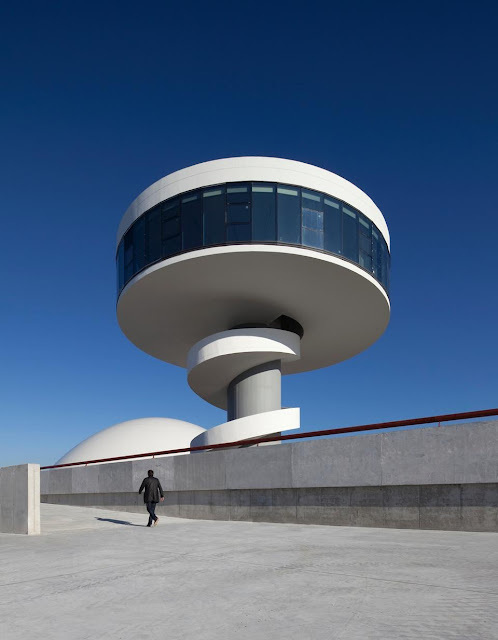 In his 2000 memoir The Curves of Time, Niemeyer writes that he deliberately rejected the right angle of rationalist architecture for the realm of bold curves and organic shapes, which, like Eero Saarinen, Jørn Utzon, Frank Lloyd Wright, and now perhaps Santiago Calatrava, he considers more essential to poured, reinforced concrete. His is therefore an oeuvre in which the functionalism of the "machine for living" is superseded by the plastic freedom made possible by reinforced concrete; wherein the monotony of pre-fabricated glass boxes might be overcome by sculptural, free-form, cast-in-place structures. While he must be considered one of the last great Modern architects in the canonical sense, Niemeyer is also a contemporary artist. With projects of more than sixty, even seventy years ago today firmly entrenched in history, these new buildings in Spain emerge in a context that has been radically changed since the ideals of Corbusian internationalism. Certainly distant from the CIAM-brand of strident formalism he initially set out against; one hopes the Centro will successfully transform this post-industrial region into a cultural Mecca.